Folkmoot USA, headquartered in Waynesville, is a folk music and dance festival celebrating a diversity of cultures from around the world. Started in 1983, Folkmoot-also known as the North Carolina International Folk Festival-features performance activities in Asheville, Maggie Valley, Mars Hill, Banner Elk, Clyde, and other towns in the western North Carolina mountains. Highlights of the mid-July celebration include an opening parade of nations and an International Festival Day that includes dancers, musicians, and crafters on the last Saturday of the event. Audience participation is invited at some events. An impressive number of countries from all over the world have been represented since Folkmoot began, including China, Cyprus, Latvia, Puerto Rico, Turkey, Egypt, Germany, and others. Organizers also coordinate cultural visits of international youth groups who live with local students and their families in the community, visit schools, and perform during the school year. 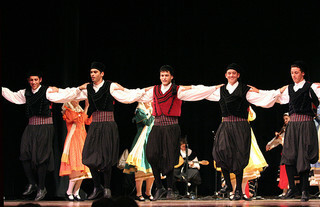 Dancers from Greece performing on stage, Folkmoot, 2009. Image courtesy of Flickr user anoldent. Available from http://www.flickr.com/photos/anoldent/3745960396/ (accessed June 12, 2012). In 2003, the General Assembly designated Folkmoot USA as the official State International Festival of North Carolina. General Statute: §145-19, (2003-315, s. 1.). 1 January 2006 | Pertalion, Patricia L.